Helmet cameras have now achieved the pinnacle of HD recording: 1080p. If you have the cash, a head, and a pastime worth filming you have a few choices for full HD extreme POV recording. So what's a little lid-mounted recorder to do for its next trick? If you're Contour it's to add a positional sensor and the letters G, P, and S to your product and create the ContourGPS. It lets you not only record your extreme antics but also how fast you were going when you were partaking in them, plus a lot of other information. And, more promisingly, there's a suite of hardware updates here, some paving the way to letting you use your smartphone as a viewfinder. But how does this $350 piece of helmet jewelry perform on the ice? Keep on reading for some video evidence. Be the first to review the ContourGPS? The biggest update here is the included GPS receiver, naturally. Using it the camera adds positional information to the footage that it captures (at your choice of resolutions up to 1080p), which lets you later view the path covered and speed achieved while recording. Also new is a Bluetooth module, a nugget of silicon that's not doing anything right now but, in the near future, will enable mobile devices to receive video in real-time and to modify camera settings, a feature Contour calls Live Viewfinder. 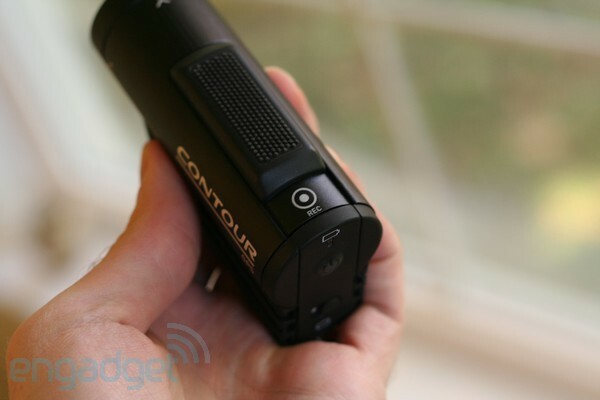 Beyond that Contour has a habit of subtly tweaking and improving its camera designs with each revision, with the ContourHD 1080p model getting a more progressive slider compared to its 720p predecessor, along with a few other subtle tweaks. 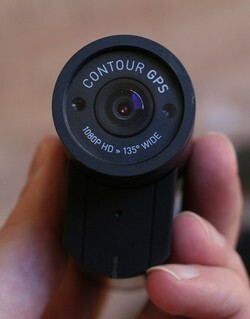 The new ContourGPS still shares the same look as those two that came before, but it offers still more modifications. The slider up top, which is used to start and stop recording, is now raised with little rubber nubbies sticking out. This makes it even easier to start and stop this camera without having to take off your super-comfy, fleece-lined mittens. Around back the door that covers the battery case is now hard plastic and spring-loaded, much more secure than the previous one that always felt a bit flimsy. To keep it from flipping open at the wrong time a little lock has been added, but the push power button on the back remains unchanged. It's still awful hard to find with gloves on and sometimes hard to activate even bare handed. Flip the door open and the layout inside is much the same, with a miniUSB port on the left (still no micro), battery on the right, and a microSD slot in the middle. The battery is now held in place by a spring-loaded clasp instead of the finicky rotating lock that always gave us problems before, and there's a tiny switch that lets you toggle between one of two modes. Which two modes? We're glad you asked. We've never exactly been a fan of the software suite that's been provided with Contour's cameras, so we weren't too disappointed to see a wholly new software suite introduced here. It's called Storyteller unfortunately it's basically the same as before. 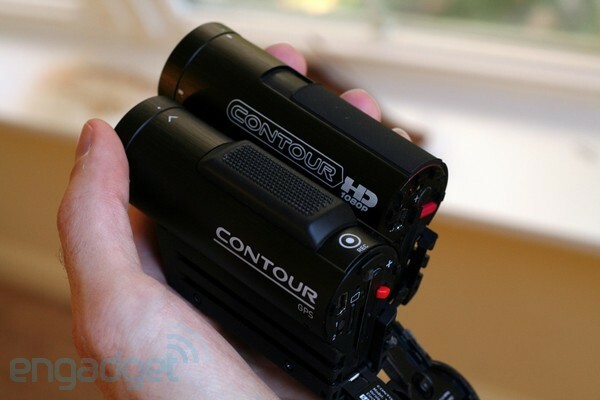 Through this app you can download footage from your camera, view it, and upload it to Contour's site. You can also do simple editing -- as long as you only want to trim the front and the back off of the video. You can't do anything more advanced and, while you're free to do what you will using an external video tool (footage is encoded in a .mov container), if you do so you'll lose the GPS data. So much for that idea. 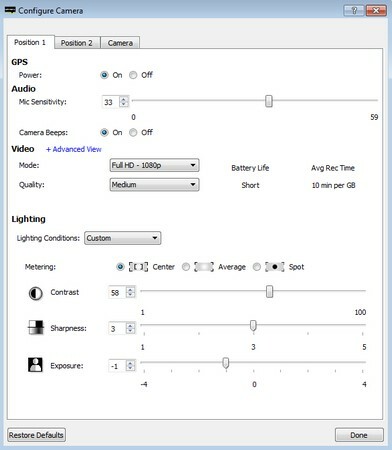 The software also lets you configure the camera, creating two configurations with different resolutions, exposure and sound settings, and also selecting whether GPS is enabled. Many of these tweaks will mess with your battery life, which the app will warn you about -- though it stops short of giving you any estimated figures. Upload a video from the app and it'll show up on the Contour website, which attempts to offer a bit more social interaction than your YouTubes and the like. More important is that it has room for a map over on the right, providing a real-time Google Maps overlay of where the wearer was during this frame of footage and how fast they were going. At least, it will do that assuming the camera scored a GPS lock before the footage started recording. Our first impressions with the camera out of the box were good, improved hardware feeling nice but still sharing the same sophisticated design as before. Sadly, our first impressions trying to use the thing were not so good. There's a little light on the front of the camera that blinks green when it's looking for GPS, turning solid when locked on. Initially, we tried and we wished as hard as we could but we just couldn't get it to go solid. Using the initial firmware for the camera, even leaving the thing outside and on for 30 minutes we'd struggle to get a lock, and any trees in the vicinity would prevent that. However, about a week after this review initially went live we were provided with a firmware update that comprehensively fixed this problem. GPS locks were scored in under 30 seconds, trees or no trees. You can see the results in the embed above, which charts our progress around the plowed out track, chasing down an opponent in a white Mitsubishi EVO. The pass was ultimately made but the position later given back, clipping a snow bank on the last lap of the race. Unfortunately we can't show you that part because the driver of the camera car took that opportunity to hurl a few choice bits of profanity. Since the Storyteller app doesn't allow you to cut out sections or do anything with the audio we simply had to cut the clip short. Overall video and audio performance of the camera seems unchanged from our earlier review of the Contour 1080p, so you'll want to read that. Wind noise at high speeds is perhaps a bit better managed here but still very noticeable, as you can see in this other clip that we captured with the camera mounted on the roof. Curiously, the GPS didn't work for that one. Battery life seems comparable to the 1080p model as well -- at least it is with the GPS module disabled. Recording at the highest quality 1080p mode with GPS enabled we eked out a minute short of two hours before our camera went kaput. Without GPS that time went up to 2.5 hours. Moving down to a 720p encoding at a lower bitrate battery life jumped another 30 minutes to three hours of continuous recording. If that's not enough you can plug the camera in to a charger while it's in use, assuming you have access to a charger while doing whatever extreme thing you're doing. GPS accuracy, meanwhile, is good, but a low refresh rate in the camera can make for some occasionally chunky interpretation when you're moving at speed, as evidenced in the hairpin turn. You can see the difference of the camera's trace above on the left, compared to an external 5Hz Bluetooth GPS unit connected through TrackMaster on Android, shown on the right. However, since we initially published this review this footage Contour has released an update enabling 4Hz refresh rates in GPS, which goes a long way to making things much more smooth. The ContourGPS offers a subtly improved design that we think is definitely a step forward, and the inclusion of Bluetooth to enable the use of a smartphone as a viewfinder will be a huge coup when that releases. But the extra cost here -- $350 vs. $280 for the 1080p model -- is still something of a hard sell. If you disposable income reserves are solid and you're curious just what speeds you hit on the double-diamond, this is the camera for you. More budget-conscious might want to go with the 1080p, get an extra battery for $30 and spend the rest on a nice dinner. But be warned: take that route now and you might be a little jealous when that upcoming live viewfinder mode comes to life. Update: We got a note from Dmitriy letting us know there's a hidden tweak you can manually make to the camera's configuration that allows you to run the GPS unit at a higher refresh rate. This should result in a cleaner resulting map if you're doing high-speed stuff, like we were here. Update 2: Contour provided a new firmware for us to test about a week after this review went live and it comprehensively fixes the GPS issues we had. Even standing near trees we were able to get a lock in under 30 seconds, and when filming numerous clips (like the one embedded below) the signal was never lost. Whether the camera is worth the additional cost over the 1080p model is of course still up to you, but the considerably improved performance is worth an extra point on the review score in our book.